Chris was candid and straightforward during his participation at the reception and panel discussion. His photo is one of 30 featured in the show. Panelists, from left, photographer Kathy Shorr, Movita Jonson-Harrell, founder of the Charles Foundation, Cheryl Seay and Joel Seay, founders of Love and Laughter Foundation, Chris, Kareem Nelson, founder of Wheelchairs Against Guns, and MCCC Professor of Communication Alvyn Haywood, who served as moderator. 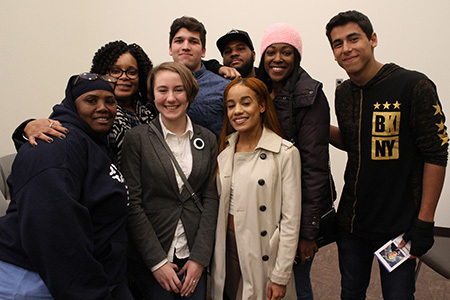 Charles Foundation founder Movita Jonson-Harrell, far left, with MCCC photography students. The exhibit demands the viewer's attention. Kathy Shorr expressed her appreciation to the panelists. "Everyone here is dedicated to improving the lives of others," she said. At the reception, from left, Gallery Director Michael Chovan-Dalton, JKC Provost Monica Weaver, Photographer Kathy Shorrr and Professor Alvyn Haywood. 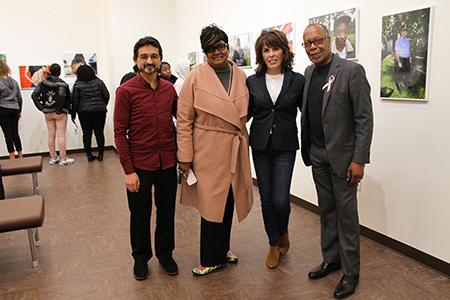 Trenton, N.J. – Six individuals who have been deeply affected by gun violence participated in a panel discussion on Nov. 16 as part of the community reception for Kathy Shorr’s “SHOT,” on display at the James Kerney Campus Gallery (JKCG) of Mercer County Community College (MCCC) through Dec. 6. JKCG is located on the ground floor of Trenton Hall, 137 North Broad Street, across the street from the Kerney Building. Professor of Communication Alvyn Haywood served as the panel’s moderator. The audience included students from MCCC’s Digital Photography I and Black and White Film Photography classes, along with numerous members of the community. 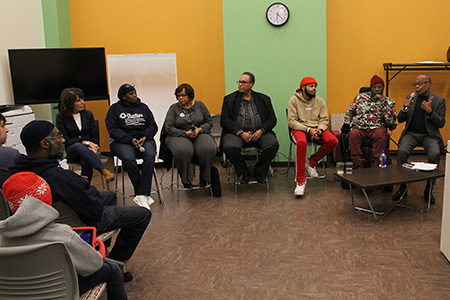 In an emotional and riveting presentation, the survivors, some of whom are gunshot victims and others who have lost loved ones to gun violence, discussed how they have turned their grief into action. As a crime victim herself, Shorr told the guests that the project had been on her mind for years. She began it in earnest in 2013 when she was working as a teaching fellow in the New York City public schools. “I saw people in the schools wearing memorial cards on lanyards for their loved ones who had been killed and I wondered why no one was speaking about the survivors,” she recalled. 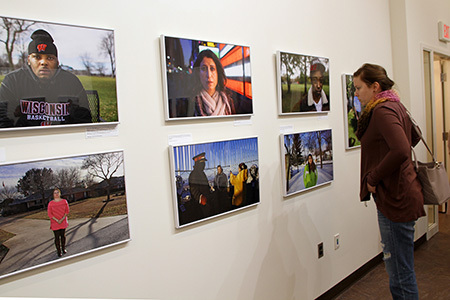 The JKCG exhibit includes 30 photos from Shorr’s book “SHOT,” which was published in the spring and features 101 survivors of gun violence from across the country, of different ages, ethnicities and backgrounds. Shorr stressed that the exhibit is not meant to be political, but rather to start a dialogue about an issue that impacts Americans nationwide. The organizations they have founded include the Charles Foundation, a Philadelphia-based non-profit created to help at-risk children; Love and Laughter Foundation, a Philadelphia-based group seeking to connect communities while protecting children through gun violence prevention, safety, and education; and Wheelchairs Against Guns, a Brooklyn-based group that presents workshops at inner city schools and churches with members sharing stories of personal tragedy. “We want to teach young people ways to avoid toxic situations through conflict resolution, critical thinking, and self-esteem building techniques,” said Wheelchairs Against Guns’ founder Kareem Nelson, who has been in a wheelchair for 20 years from injuries that date back to the crack epidemic of the late ’80s and early ’90s. “I lost sight of what was important,” Nelson said. Now he is dedicated to helping others make better choices. Movita Jonson-Harrell, who lost her son, Charles Andre' in 2011, is a social worker who started visiting schools just months after his death. She has found that as early as first grade, children are hearing gun shots outside their homes. “Young kids want to be heard. And they want to be provided with a safe space” Jonson-Harrell said. Another panelist, 23-year-old Chris, recalls being “young, dumb and running around” when he was shot multiple times by someone looking for drugs. As he recovers and works through the trauma, he speaks whenever and wherever he can about the lessons he has learned. “I go to schools and talk to kids. They haven’t seen what I have seen. We’ve got to teach young people about the value of life. It’s not about sneakers or your phone. It’s all about the people around you. Somebody has to have real conversations with these kids,” Chris said. The panelists’ stories clearly resonated with members of the audience, many of whom indicated that they have been to funerals of loved ones and friends killed due to gun violence. MCCC student Jessica Perez stressed the need for more after-school activities for young people. “One of my friends was killed. When the killer was asked why he did it, he said it was something to do,” she recalled. Another audience member, a former security officer in the Trenton Schools, applauded the panelists for visiting schools with their message. “We should be educating young people to make smarter choices,” she said, noting the added negative impact of violent video games and the pressures of social media, where disputes often turn toxic. Gallery Director Michael Chovan-Dalton, who has presented three shows this fall, said that “SHOT” is an especially moving example of his goal for the JKC Gallery. “I am interested in photographers, artists who use photography, and filmmakers who work in a long-term documentary style and have clear themes to convey. My intention is to show lens-based artists whose work helps us examine our humanity,” Chovan-Dalton said. Hours for this exhibit are Mondays, 10 a.m. to 2 p.m.; Wednesdays, 10 a.m. to 2 p.m.; and Thursdays, 10 a.m. to 5 p.m.
Up next at JKCG is “Eleven Years,” works by Jen Davis, from Jan 25-Feb. 22. A Reception and Artist Talk takes place Jan. 31 from 5-8 p.m. Davis’ book, Eleven Years, helped inform a national conversation about body image and fat shaming. View the full schedule here.